Gastrointestinal stromal tumors (GISTs) represent a rare but distinct histopathological group of intestinal neoplasms of mesenchymal origin. Their incidence is only 0.2% of all gastrointestinal malignancies. Despite the development of a new chemotherapeutic agent, imatinib mesylate, surgery remains the only curative treatment for non-metastatic gastric GIST. Resection with a negative margin should be performed. Lymphadenectomy is not necessary, because gastric GISTs rarely metastasize to the lymph node. Wedge resection has been practiced in open and laparoscopic procedures, but recent National Comprehensive Cancer Network (NCCN) guidelines have not yet described definite indications for these options. Currently, laparoscopic wedge resection is a good surgical option for gastric GIST and is an alternative to conventional open surgery. However, there has been controversy regarding tumor size in laparoscopic surgery for gastric GISTs. Recent reports show that laparoscopic or laparoscopic-assisted resection may be used for small gastric GISTs. However, no report on the long-term safety and efficacy of this surgery for large-sized gastric GISTs has been published to date, even though some publications showed its short-term feasibility for large gastric GISTs. In this report, we present a retrospective review evaluating the clinicopathological characteristics, postoperative outcomes, patient survival, and tumor recurrence of gastric GISTs after surgical treatment. Moreover, we tried to confirm the safety and efficacy of laparoscopic surgery for gastric GISTs larger than 5 cm in size. 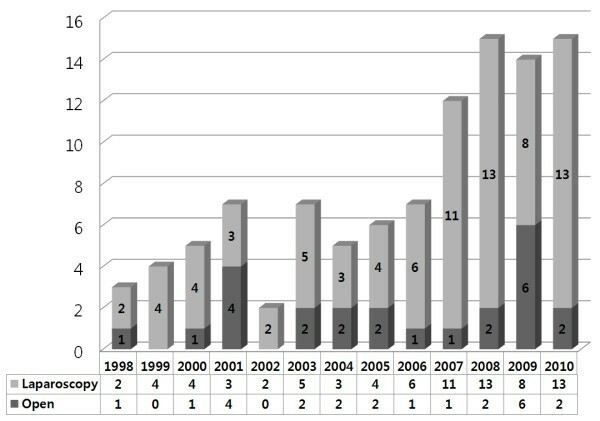 We reviewed the medical records of 104 patients with gastric GISTs who underwent curative resection in Dong-A University College of Medicine between July 1998 and January 2011. Patients with unresectable metastasis or concurrent cancer other than gastric GIST were excluded. We made the diagnosis of gastric GIST by final pathology among the patients with gastric submucosal tumors which were found preoperatively by esophagogastroduodenoscopy (EGDS), abdominal computed tomography (CT), and endoscopic ultrasonography (EUS). According to risk classification suggested by Miettinen et al., the gastric GISTs were divided into eight groups based on maximum tumor diameter and mitotic activity per 50 high-power fields (HPFs), as previously detailed (Table1). Patient characteristics, measured perioperative parameters that included operation method and type of resection, operative times, length of hospitalization, complication, tumor recurrence, median follow-up periods, and patient survival were evaluated. Also, we compared the clinicopathologic characteristics and postoperative outcomes of patients with large tumors (5 to 10 cm) between laparoscopic and open surgery. GIST gastrointestinal stromal tumor, HPF high power field. On very low- and low-risk groups according to a previous classification, CT was checked every 6 months during first the 2-year period, and then every year during next 3-year period. Endoscopy was performed every year for the first 5 years. For the intermediate and high-risk groups, CT was checked every 3 months for the first 2 years and then every 6 months for the next 3 years. Endoscopy was performed every year for the first 5 years. In cases of resectable tumor recurrence, we performed additional surgery. In the other cases of unresectable tumor recurrence, imatinib treatment was started at an oral dose of 400 mg daily and was increased to 600 to 800 mg daily if the disease progressed. After the induction of general anesthesia, the patient was placed in the reverse Trendelenburg and supine position. The surgeon stood on the patient’s right, with the first assistant on the patient’s left and the camera operator on the surgeon’s right. Typically, an umbilical trocar (10 mm) was inserted using the open method. A carbon dioxide pneumoperitoneum was created using the umbilical port, and the pressure was maintained between 12 and 14 mmHg. A rigid (30 degree) laparoscope was then introduced through the umbilical port. Under laparoscopic guidance, an additional two (5-mm and 12-mm) trocars were introduced, consisting of the right subcostal and right mid-abdominal ports. Occasionally, we inserted an additional 5-mm trocar at the left mid-abdominal area (Figure1). The locations, size and site of the trocar. Routinely, three ports (5-mm, 11-mm, and 12-mm) were used during laparoscopic surgery. Occasionally, if a further site was needed, a 5mm trocar was introduced into the left mid-abdominal area. After the gastric wall had been devascularized and exposed using Harmonic ACE (Ethicon Endo-Surgery, Cincinnati, OH, USA), wedge resection of the gastric wall was performed using laparoscopic stapling devices (Echelon Flex, Ethicon Endo-Surgery, Cincinnati, OH, USA). Resected specimens were placed into an endoscopic retrieval bag and extracted via the umbilical wound. In all cases, our pathologist reported a free margin of normal gastric wall on frozen section biopsy. One closed suction drain was placed around the surgical site at the end of the procedure and trocar wounds were closed. Chi-square and independent t-tests were used to compare the clinicopathological factors of patients between the laparoscopy and open surgery group using GraphPad InStat® (version 3.06, GraphPad Software, Inc., La Jolla, CA, USA). Statistical significance was assumed for P-values < 0.05. Survival curves were calculated by the Kaplan-Meier method. The log-rank test was used to analyze survival differences and SPSS version 18.0 (SPSS, Chicago, Ill, USA) was used for the analysis. 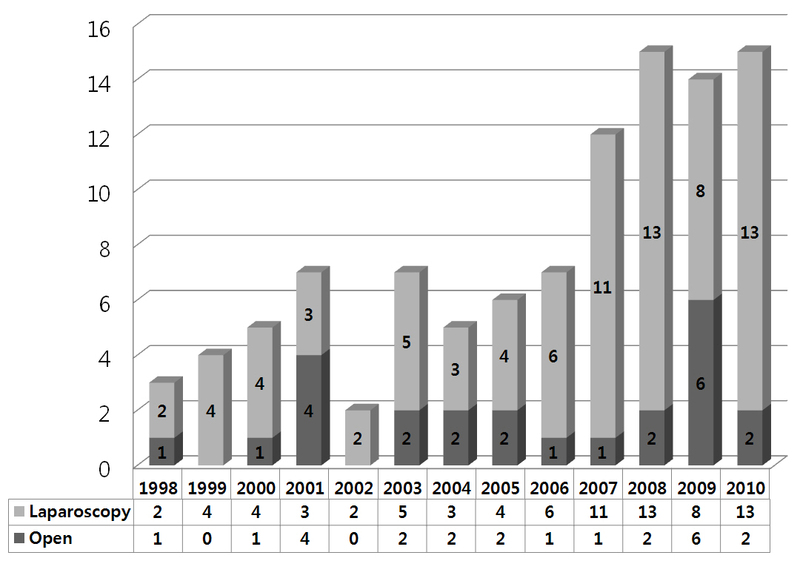 Figure2 shows the operative methods (laparoscopic and open) of the patients who underwent curative resections in our institute during the period between 1998 and 2010. The numbers of laparoscopic cases has increased annually. Yearly operative trends for primary gastric gastrointestinal stromal tumor (GIST). The numbers of laparoscopic resections has increased annually since 2007. Table2 shows a summary of clinical features of the 104 patients who underwent laparoscopic and open surgery for gastric GISTs. There were 47 male and 57 female patients, with a mean age of 59.8 ± SD 10.5 years. Forty patients (38.5%) were diagnosed incidentally and were asymptomatic. Among 64 (61.5%) symptomatic patients, the most common symptom was pain. Sixty-one (58.7%), 24 (23.1%), and 19 (18.2%) of the 104 tumors were located in the upper portion, middle portion, and lower portion of the stomach, respectively. The patients were subdivided into eight groups according to Miettinen’s classification: 10 (9.6%) in group 1, 49 (47.1%) in group 2, 15 (14.4%) in group 3a, 9 (8.7%) in the group 5, 14 (13.5%) in group 6a, and 7 (6.7%) in group 6b. Laparoscopic and wedge operation were more frequently performed. Surgical margins were all observed to be free on histopathologic studies. There was no tumor rupture during surgery. Among 104 patients, there was one minor complication in a laparoscopic wedge resection. One patient who experienced delayed gastric emptying was treated with conservative care. Recurrences were noted in five patients during a median follow-up period of 49.3 (range 8.4 to 164.4) months. *Values are mean and standard deviation; †based on the Miettinen classification; n, number of patients. To evaluate differences between laparoscopic and open surgery for larger tumor (5 to 10 cm), we compared the two groups. There were statistically significant differences in age, tumor size, tumor location, and duration of hospital stay (Table3). *Values are mean and standard deviation; †based on the Miettinen classification; n number of patients. Table4 shows the clinicopathologic characteristics for recurrent cases after curative resection. Tumors recurred in five patients. The recurrent cases belonged to group 5, 6a, and 6b according to Miettinen’s classification. Initial operations for these patients were open surgery in four patients and laparoscopic surgery in one patient. Tumors recurred in the peritoneum (two patients), the remnants of the stomach (one patient), the liver (one patient) and the colon (one patient). Three patients underwent reoperation, and two were treated only with imatinib mesylate. Among the patients with tumor recurrence, two have survived to date. N patient number, F female, M male; †Based on the Miettinen classification. The 5-year overall and disease-free survival rates of gastric GISTs were 98.6% and 94.8%, respectively (Figure3). Comparison of cases of laparoscopic and open surgery for large tumors (5 to 10 cm) showed that there were no statistically significant differences in 5-year overall and disease-free survival rates between the two groups (P = 0.067 and 0.083, respectively) (Figure4). Survival characteristics of all 104 patients. The 5-year overall survival rate (A) and disease-free survival rate (B) were 98.6% and 94.8%, respectively. Surgical resection with negative margins without lymphadenectomy has been the treatment of choice of gastric GISTs up to now. Histologically, a 1 to 2 cm margin has been thought to be necessary for adequate resection[9, 10]. However, more recently, DeMatteo et al. said that tumor size and negative microscopic surgical margins did not determine the survival. It is therefore accepted that the surgical goal should be complete resection with gross negative margins only[3, 11]. Given this, wedge resection has been advocated by many investigators for the majority of gastric GISTs[3, 10, 11]. Currently, gastric GISTs are viewed as a good indication for laparoscopic resection. Moreover, the development of laparoscopic stapling devices and surgical techniques has made laparoscopic wedge resection an attractive alternative to conventional open surgery. In this study, laparoscopic surgery has been performed with an annually increasing tendency, and wedge resection was more commonly advocated. This shows that laparoscopic wedge resection has become the mainstay of treatment for gastric GIST. Recent reports from the National Comprehensive Cancer Network (NCCN) GIST Task Force and the GIST Consensus Conference under the auspices of The European Society for Medical Oncology (ESMO) state that laparoscopic or laparoscopic-assisted resection may be used for small gastric GISTs (that is, those < 2 cm in size). However, Ronellenfitsch et al. stated that the tumor size did not determine the feasibility of laparoscopic wedge resection, and the location of the gastric GISTs did not directly affect the indication for laparoscopic wedge resection. Whereas Yang et al. reported on the performance of laparoscopic wedge resection for tumors less than 6 cm in diameter, Ronellenfitsch et al. and Huguet et al. reported its feasibility for tumors bigger than 10 cm in diameter. The Japanese clinical practice guidelines for GIST suggest that laparoscopic resection of gastric GISTs smaller than 5 cm appears safe when performed by a skillful surgeon who is thoroughly familiar with the neoplastic characteristics of gastric GISTs. Before 2005, in our institute we performed open surgery for tumors bigger than 5 cm and for those located at the cardia. As our experience has increased, we have been performing laparoscopic surgery on tumors smaller than 10 cm regardless of their location. We classified the 38 patients who had large tumors (5 to 10 cm) into those who received laparoscopic versus open surgery. Although there were statistically significant differences in age, tumor size, and tumor location, we thought that these variables were not considered to be factors that were comparable between laparoscopic and open surgery. From the point of view of the merit of laparoscopic surgery, the length of hospitalization was statistically shorter in laparoscopic surgery than in open surgery. Moreover, the operation time was shorter in laparoscopic surgery, although there was no statistical difference. In terms of survival rates, there were no statistical differences in overall and disease-free survival rates, although the survival graphs appeared to be different. In the case of gastric GISTs bigger than 10 cm, surgeons were concerned about the operative methods of laparoscopic versus open surgery. The merits of laparoscopic surgery included lesser degree of pain, smaller wound size, shorter hospital stay, and earlier recovery. However, in order to safely retrieve a mass bigger than 10 cm, a larger wound incision was needed, as in open surgery. Moreover, laparoscopic surgical techniques became more difficult in cases with bigger gastric GISTs, and there was a possibility that tumor cells would spread due to the rupture of the capsules. Therefore, with bigger tumors, special attention should be paid to the prevention of capsular rupture. It should also be emphasized that careful laparoscopic evaluation of the tumor size, and its characteristics in terms of the possibility of capsular rupture during further manipulations, should be performed, giving timely conversion to the open method whenever necessary. In our series, for the prevention of tumor spread during laparoscopic surgery, we tried to grasp the stomach and normal tissues around the tumor. In our study, there were seven patients with tumors bigger than 10 cm, three of whom underwent laparoscopic surgery, while four underwent open surgery. In addition, there were no capsular ruptures in the three patients who had laparoscopic surgery. The recurrence rate after surgery in reported series ranges from 17 to 24%[17, 18]. In recurrent gastric GISTs, some reports demonstrated that a combination of surgery and targeted therapy may reduce the development of recurrence or decrease the risk of disease progression[19, 20]. Although most of our patients who underwent surgical resection were at very low, or low malignant potential (74/104, 71.2%), we had a lower recurrence rate in our series compared to other reports[17, 18]. We experienced five cases (5/104, 4.8%) of recurrence, with a median follow-up time of 49.3 months (range, 8.4 to 164.4 months) after surgical resection for gastric GISTs. Three patients underwent reoperation, and two were treated with imatinib mesylate. Unfortunately, none of the patients responded to imatinib mesylate, and two patients who underwent surgical management are currently living. 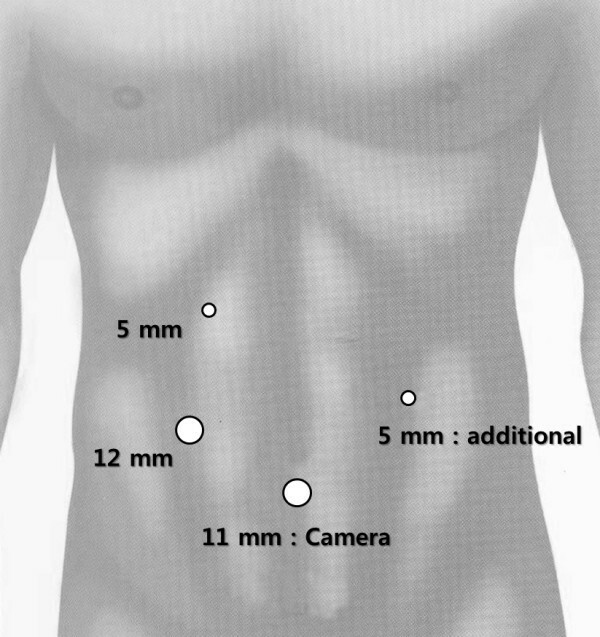 Although this was a retrospective research study of laparoscopic and open surgery for gastric GIST, and large tumors 5 to 10 cm in size, and although it was not a case-matched study of laparoscopic and open surgery, it provides a basic guideline to determine the size-related indication for laparoscopic surgery for gastric GIST. A prospective randomized controlled study of tumors larger than 5 cm is necessary. The clinical outcomes of gastric GISTs with very low or low malignant potential were excellent. The group of patients who had gastric GIST with high malignant potential showed an increased recurrence rate and less favorable survival rates, which merits careful attention. In terms of the operative method, laparoscopic surgery was an effective oncological treatment for gastric GIST. Although this was a retrospective, research study in a single institute, it is thought that laparoscopic surgery would be a good alternative to open surgery for the treatment of large gastric GIST bigger than 5 cm in size. This work was supported by the Dong-A University research fund. All authors disclose no financial relationships relevant to this publication.